Of course, by their nature of being ‘limited’ and in many cases signed, the rarity of these publications demands a high price. Also, his early work such as Poems 1906, Orpheus in Diloeryum 1908 and Sonnets and Verses 1909, (Sassoon destroyed all but three copies of this last book), are practically unobtainable. The books on this page are those that I have in my collection, and it is not a complete list of every limited edition Sassoon published. I am always looking out for more examples and very occasionally as I obtain them I will add them to this select list. Nativity By Siegfried Sassoon, (Keynes A27b). Published in 1927 by Faber & Gwyer. This was a limited Edition of the poem Nativity in the Ariel Poems series. 350 copies were published on handmade paper, this is copy 256. 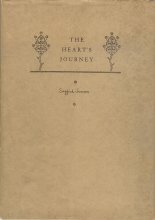 The Heart’s Journey, First English Limited Edition (Keynes A28). New York: Crosby Gaige, London: William Heinemann, Ltd. 1927. 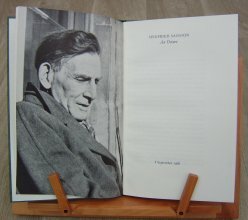 This edition was limited to 590 copies, of which 250 were for sale in the United Kingdom, each copy being signed by the author, Siegfried Sassoon. Left: Printed front of the dust jacket. right: Title page, with Sassoon’s full signature between the two rosettes. The book contained 28 poems and this particular copy is uncut, the top edges of each pair of pages remain joined together. 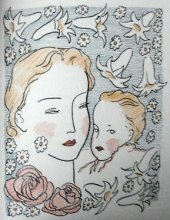 To My Mother (Keynes A29b) Limited Edition - A poem by Siegfried Sassoon, published in 1928 by Faber & Gwyer Ltd. 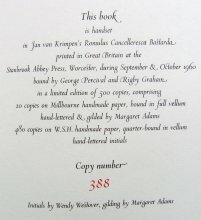 This was the large paper edition printed on handmade paper (Curwen Press), limited to 500 copies. 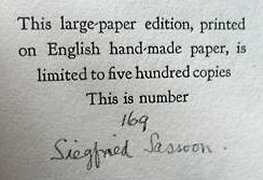 Each copy was signed by Sassoon, this copy being number 169. Along with the poem the book also contains two drawings by Stephen Tennant. The contents of the book are the same as the ordinary edition, No. 14 in the Ariel Poems Series, published in the same year. Memoirs of a Fox-Hunting Man - (Keynes A30b) By Siegfried Sassoon, published 29th October 1928, by Faber & Gwyer Ltd. This was printed on English hand-made paper and limited to 260 numbered copies, each copy was also signed (centre). The copy I now have in my possession is numbered 41. This book was only issued with a transparent tissue dust jacket, and it very rarely survives. I have seen dealers describe it as “missing its pictorial dust jacket,” this was never the case. This edition is larger in size compared to the the first ordinary edition, (22.5 x 14 cm as opposed to 18.5 x 12 cm). Keynes states that this special printing was an afterthought, made when the success of the ordinary edition was assured and the identity of the author known. I was unaware when I bought this book in an on-line auction that it carried a bookplate. This ought to have been mentioned in the description. Although it does not affect the price, some collectors do not like bookplates in their books. This particular one though is of interest as it is the bookplate of Jean Hersholt (and signed by him), a leading light in radio and films in the first half of the 20th century. 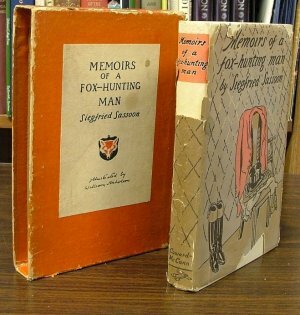 US, illustrated edition of Memoirs of a Fox-Hunting Man. Keynes does not describe this book as a separate publication in his bibliography, but in his description of the English illustrated edition (A30d) he notes that a “limited edition” of 1500 copies with Nicholson’s illustrations was published in New York in 1929 by Coward-McCann. That edition is the book shown here. Interestingly, as can be seen, the book was issued with a slipcase, something that I have never seen before and as far as I can gather is quite a rare find if still present with the book. In this particular case the dust jacket is in very poor condition and has since been covered with a protective sleeve to prevent further deterioration. In Sicily, A poem, Ariel Poems No. 27 Limited Edition, (Keynes A34b), by Siegfried Sassoon, published in 1930 by Faber & Faber Ltd.
Memoirs of an Infantry Officer - (Keynes A33b) By Siegfried Sassoon, published 18th September, 1930, by Faber & Faber. This was printed on English hand-made paper and limited to 750 numbered copies, each copy was also signed (centre). The copy I now have in my possession is numbered 539. This book was only issued with a transparent tissue dust jacket, and it very rarely survives. I have seen dealers describe it as “missing its pictorial dust jacket,” this was never the case. This edition is larger in size compared to the the first ordinary edition, (22.5 x 14 cm as opposed to 18.5 x 12 cm). Many of the pages are uncut. Also included in the purchase of this book was an original photograph of Heytesbury House, taken just inside the original front gates, and an envelope containing a letter from Sassoon, dated 8.8.46, to a Mr. D. G. A. Low Esq. The letter, on Heytesbury House notepaper, talks about ‘Captain Huxtable,’ explaining he was really Captain Ruxton. 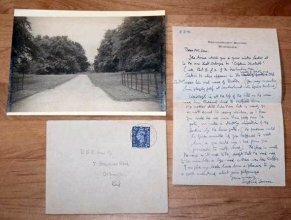 Sassoon also discusses his mother’s house ‘Weirleigh,’ Paddock Wood, Matfield, and explains how to get there for a “stealthy inspection.” He ends, “I am glad my books have been a pleasure to you I quite understand about your pilgrimage.” Clearly Mr. Low was embarking on a trip to visit locations in Sassoon’s books and had asked for some advice. The letter carries Sassoon’s full signature and is a delight. The full transcript can be found on the Letters page. To the Red Rose (Keynes A36b), by Siegfried Sassoon, published on 8th October, 1931, by Faber & Faber. Illustration inside by Stephen Tennant. 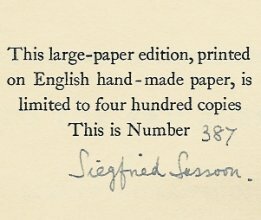 This edition, number 387 is one of only 400 copies published and is signed and numbered by Siegfried Sassoon. It was preceded by the Ordinary Edition (Keynes A36), which was No. 34 of the Ariel Poems series. Vigils (Keynes A39) First English Limited Edition. 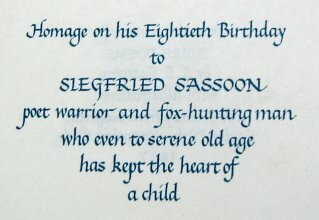 Collection of 22 Poems privately printed in 1934 by Siegfried Sassoon. This copy No 66 of 212. Bound in undyed niger morocco, printed on handmade paper, engraved on copper by Charles Sigrist and frontispiece designed by Stephen Gooden. Sherston’s Progress - (Keynes A40b) By Siegfried Sassoon, published 3rd September, 1936, by Faber & Faber. This was printed on English hand-made paper and limited to 300 numbered copies, each copy was also signed (right). The copy I now have in my possession is numbered 151. This book was only issued with a transparent tissue dust jacket, and it very rarely survives. I have seen dealers describe it as “missing its pictorial dust jacket,” this was never the case. This edition is larger in size compared to the the first ordinary edition, (22.5 x 14 cm as opposed to 18.5 x 12 cm). Many of the pages are uncut. Common Chords, By Siegfried Sassoon, (Keynes A54), published in 1950 by Stanford Dingley and the Mill House Press. This hardback book of 18 poems was printed in a limited edition of 107 copies on handmade paper, seven of which were printed on white parchment. 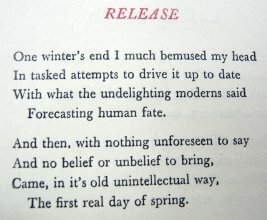 The two word title was printed in blue, and the titles of each poem in crimson. The Tasking, (Keynes A56), By Siegfried Sassoon, printed for Sassoon and Geoffrey Keynes in 1954 by the Cambridge University Press. 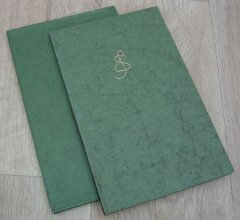 This collection of 24 poems was printed in a limited edition of 100 copies, this being copy ‘E’. The book is complete with its glassine wrapper. The book was designed by John Dreyfus in consultation with Brooke Crutchley and Geoffrey Keynes. An Adjustment, Foreword by Philip Gosse (Keynes A57), by Siegfried Sassoon. The Golden Head Press, Royston, Hertfordshire. A dramatic piece in one scene. 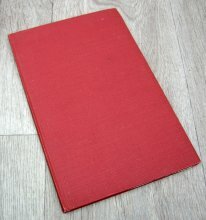 This book was published in 1955 in a limited edition of 150 copies, this being copy number 133. The book contains a facsimile page from a first edition, The Young Cricketer’s Tutor, purchased by Sassoon in 1900 and given to the cricket-mad author Edmund Blunden (1896-1974) in 1923. 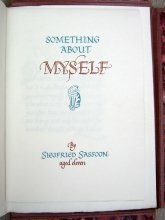 Gosse explains in his foreword that Sassoon swapped this copy with Blunden in 1934 for a better quality second edition that was inscribed by Cowden Clark. Sassoon inserted the manuscript for An Adjustment into this second copy. Lenten Illuminations - Sight Sufficient, First English Edition (Keynes A60), By Siegfried Sassoon, printed for Sassoon and Geoffrey Keynes in 1958 by the Cambridge University Press. 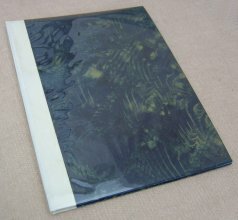 This book, containing two poems was printed in a limited edition of 35 copies. 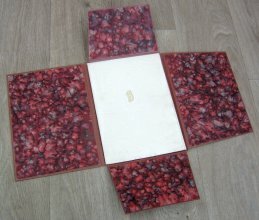 The book is complete with its glassine wrapper. The book was designed by John Dreyfus in consultation with Brooke Crutchley and Geoffrey Keynes. This book has only been traced institutionally eight times world wide, four times in the UK and four times in the US. 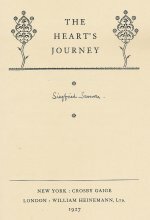 The Path To Peace, By Siegfried Sassoon, published in 1960 by the Stanbrook Abbey Press. This hardback book contains 29 poems, one, Awaitment, was laid in loose. 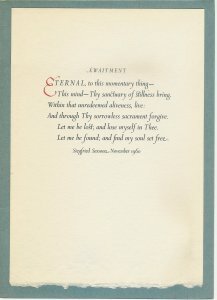 The text is printed in black and blue on Hodgkinson’s handmade paper. The initial to the first line of the first poem is done by hand in burnished gold, the first initial to all of the other poems is done by hand in red. In the copy collated by Keynes, (A62), the ‘A’ in Awaitment is done by hand in green, in the copy I have, (right), which once belonged to Siegfried Sassoon, the ‘E’ is in red. The book has a cellophane dust jacket (top left). Rogation is so rare it has not been traced to any institution in the UK, and found in just two locations in the US. An Octave, By Siegfried Sassoon, a hardback book with slipcase, published on 8th September 1966 “By a small group of his many friends and admirers.” There is a long list of subscribers at the back of the book which was printed by the Shenval Press, and has an Introduction by Charles Causley who wrote that the book contained a “group of [eight] devotional poems written at intervals during the seven years following 1957.” This book was printed in a limited edition of 350 copies, of which 100 were presented to Sassoon on his eightieth birthday and 250 were reserved for subscribers. This copy is number 307. Nativity - By Siegfried Sassoon. Twenty seven copies only printed to protect US copyright in December 1927 by William Edwin Rudge, Mount Vernon, New York. 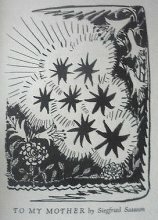 First US edition of Ariel Poem No. 7. Only twelve copies were offered for sale. Not in Keynes. 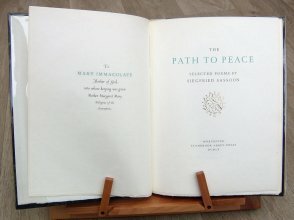 ‘Arbor Vitae’ and ‘Unfoldment’ - From ‘The Path To Peace’ - Published in 1960 by the Stanbrook Abbey Press. A single leaf of handmade paper with two poems from The Path To Peace. The cover inscribed in ink by hand, The first initials of both poems hand drawn in red. The Stanbrook Abbey Press Biblography (David Butcher), records the issue of six, single-leaf offprints from ‘The Path To Peace,’ mounted in printed or caligraphic card folders. ‘The Need,’ ‘The Contention,’ ‘Nativity’ - From ‘The Path To Peace’ - Published in 1960 by the Stanbrook Abbey Press. A single fold leaf of handmade paper with three poems from The Path To Peace. The cover inscribed in ink by hand, The first initials of both poems hand drawn in red. The Stanbrook Abbey Press Biblography (David Butcher), records the issue of six, single-leaf offprints from ‘The Path To Peace,’ mounted in printed or caligraphic card folders, this example is not recored as one of them which must make it extremely scarce. The War The Infantry Knew 1914-1919 - A Chronicle of Service in France and Belgium with the Second Battalion His Majesty's Twenty-Third Foot, The Royal Welch Fusiliers: founded on personal records, recollections and reflections, assembled, edited and partly written by one of their medical officers - (Keynes B16) By Captain James Churchill Dunn DSO, MC and Bar, DCM. Published in 1938 by P S King Ltd, in a private, limited edition of 500 copies. In preparing this book Dunn drew on the letters and diaries of 50 members (mostly captains) of the 2nd Royal Welch Fusiliers, as well as those of a handful of soldiers from four other battalions. The book gained a reputation as an outstanding account of an infantry battalion's experience on the Western Front. Although he only served with the battalion for a month in 1917 (the rest of the time he was with the 1st Battalion), in 1927 Captain Dunn asked Siegfried Sassoon to make a contribution to the book with an account of his time with the battalion. Sassoon was not inclined to do so. In 1927 the last thing he wanted to do was drag up old painful memories of a war that had marked him in so many ways, both in his character and physically (he was wounded twice). Sassoon was trying to block out those images of horror, and move on with his poetry, which was judged by many to be old-fashioned and had become unpopular now he was no longer writing about the war. Nine years ago the world wore such wild looks? Sassoon, the wonderful mass of contradictions that he was, almost immediately changed his mind. Maybe it was because he was so bound up in nostalgia that he found it more easy to look back than he had imagined. Also, as an inveterate diarist during his life in the trenches, he had a ready source of material to refer to. Sassoon sent Captain Dunn a twelve page account of his life with the 2nd battalion. Inspired by this easy outpouring of his previous life, Sassoon set out to write his memoirs, more about which can found elsewhere on this website. By the following year (1928) he had published his first book ‘Memoirs of a Fox-Hunting Man’, and later in 1930 he published his second volume ‘Memoirs of an Infantry Officer’, in which the account he sent to Captain Dunn forms chapter 12, ‘A Subaltern’s Life’. Sassoon’s memoirs were extremely well received and sold in great numbers. The War The Infantry Knew 1914-1919 was seminal in the evolution of Siegfried Sassoon as a prose writer as it was the first time he had written any prose other than in his diaries and he had certainly never published anything other than poems before. Up until now, like most collectors, I have only owned the modern paperback reprint of this book as the original 1938 edition is extremely rare. I am so glad then that I have managed to acquire this copy of Captain Dunn’s original book as it is so significant to Siegfried Sassoon’s writing, and it now sits proudly on my bookshelf next to Sassoon’s memoirs. Poems From Italy - (Keynes B18) Signed Limited Edition, this No. 42 of 110. Verses written by members of the Eighth Army in Sicily and Italy July 1943 - March 1944. With a Foreword by Lieutenant-General Sir Oliver Leese, Bart. KCB, CBE, DSO, formerly Commander of the Eighth Army, and an Introduction by Siegfried Sassoon. Published in 1945 by George G. Harrap & Co. Ltd. On handmade paper in a blue Morocco binding, limited to 110 copies, 100 for sale. The Shout - By Robert Graves. Number sixteen of the Woburn Books series. This is copy 412 of a limited edition of 530 books, published in 1929 by Elkin Mathews & Marot. I have long wanted a book signed by Sassoon’s one time friend and fellow war poet Robert Graves. This example is particularly apt as it was published in 1929, the same year that Graves published his notorious first edition of ‘Good-Bye To All That’, which broke their friendship forever.